Happy birthday to Uncle Grizzly. 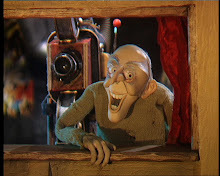 This month is the fifteenth anniversary of Grizzly Tales for Gruesome Kids on TV. ITV began transmitting the first series in January 2000. In all, eight series were made with the last new episode going out on NickToons in 2012. Reruns of the first six series began on CITV last September. There are more anniversaries to come this year. It will be five years since the programme was first seen on Nickelodeon and twenty five years since Jamie Rix's first Grizzly Tales book was published.